Help Your Friends and Earn! Summer is right around the corner, and here is a great opportunity to make a little Extra Cash and earn points to be entered to earn an iPad® Mini, and with enough points, a Sonic Life PERSONAL™ Exercise Unit! All towards the iPad Mini AND to Earning Points for the FREE Sonic Life PERSONAL Unit! The person with the most points by June 30, 2015 earns a FREE iPad® Mini! After that, points are accumulated every 2 months and iPads will be given away on August 31 and October 31 of 2015 to the person with most points for those two month periods! NO LIMIT on How Many Rewards You Can Earn on Purchased Sonic Life Units! You may also direct your CASH toward the purchase of any Sonic Life Unit! The Clock is Ticking. So get on it!! First iPad Mini Give-Away is June 30, 2015! 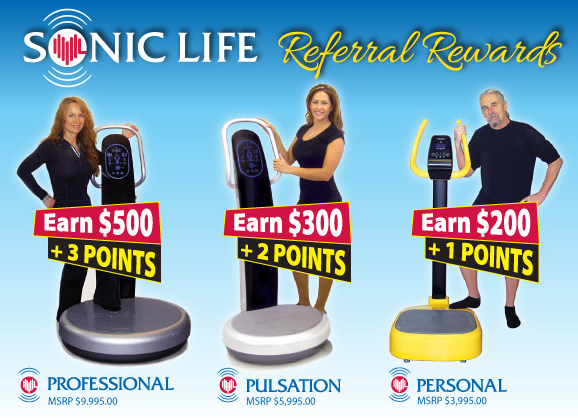 First Sonic Life PERSONAL UNIT Give-Away is December 31, 2015! So get on it and tell all your friends, FB friends, Twitter followers, Linkedin and the world, about all the feel good benefits of Sonic Whole Body Vibration from Sonic Life, and earn some Extra Cash! And an iPad Mini and a Sonic Life PERSONAL Exercise Unit! Be sure to have the person you referred tell us your name when they place their order! Or better yet, call us and give us your name and contact info and who you referred to us! * These statements have not been evaluated by the FDA. These products are not intended to diagnose, treat or cure any disease. This offer does not apply to previous orders and only applies to sales made directly with Sonic Life Corporate. » Help Your Friends and Earn!